Combine a cartridge, great compelling storyline and gripping gameplay and what do you get? Ecks V Sever is what. The storyline covers two tales of FBI Agent Jonathan Ecks and Rogue NSA Agent Sever, you can choose the character you want to play and the storyline differs dramatically depending on who you choose. 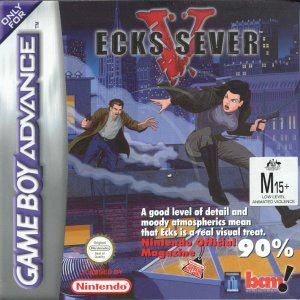 With over 24 missions to complete in single player mode and multiple multiplayer mayhem abounding, Ecks V Sever is an absolute riot to play! 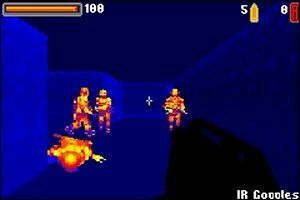 The Gameboy Advance console truly comes of age in this fantastic mature players game. The storyline plays out as each Agent gives evidence. The game has been fully configured to take advantage of the Advance's controls with everything but a jump feature being implemented. You can duck, strafe etc for maximum control of your character. 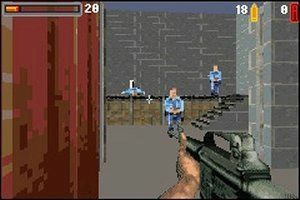 Many weapons are featured in the game and it is simple to change from one to the other by just pressing the Select button. The character's default weapons are pistols that do not run out of ammo. However if you are out, the reload time for a single round is just enough to get you out of trouble and nothing else. The level of detail is fantastic and will drag you into the game whether you like it or not! 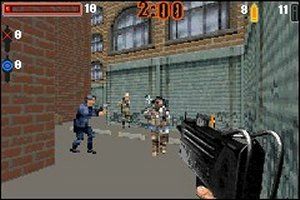 With varying modes of gunfire, including sniping and night vision the title is a strong First Person Shooter outing for this hand held entertainment system. The ending will surprise you as well, but I'm not going to wreck it for you!